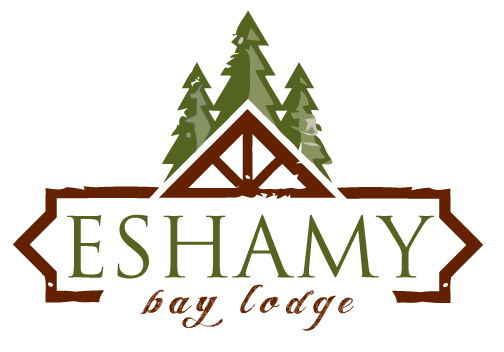 On the trip to and from the lodge as well as at Eshamy Bay Lodge, visitors can expect to see, otters, seals, sea lions, Dahl Porpoise, eagles, as well as a variety of birds. 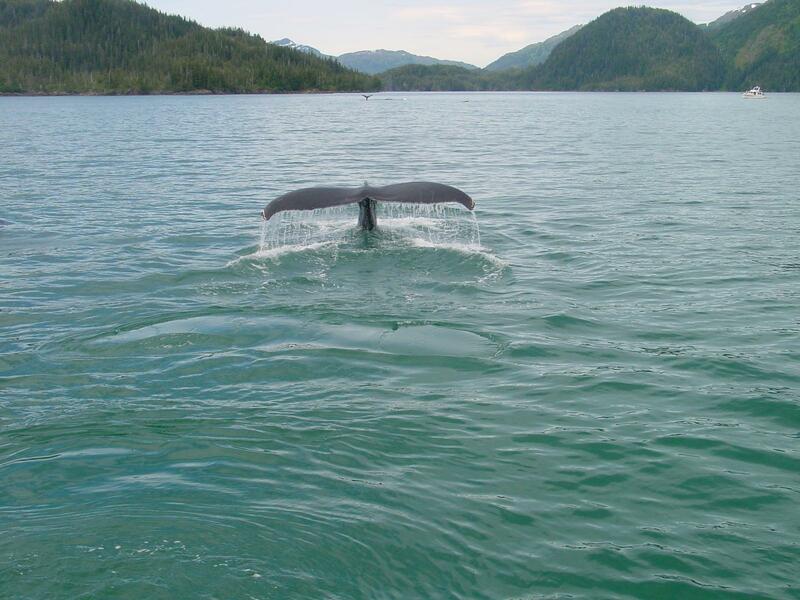 As a result of the very rich waters of Prince William Sound, we are lucky to have an abundant population of humpback whales, some of which migrate here in the summer months to feed, and others which stay in the sound year round. Humpback Whales average 40-45 feet long but can reach lengths of up to 55 feet. Humpbacks weigh 20 to 40 tons, are grayish in color, and the average life expectancy for an adult is 45-50 years with some being found to live up to 95 years of age. 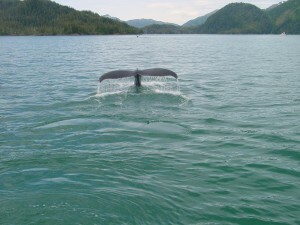 The Humpback is characterized by its tapered head and unusually long pectoral fins. They have the largest scalloped, winglike flippers of any whale species. They typically submerge for as long as 30 minutes although most dives do not last longer than 15 minutes. Humpback Whales can be extremely entertaining to watch because they can often be seen breaching, characterized by throwing themselves completely out of the water. You may also see Humpbacks swimming on their back with both flippers in the air or raising their huge fluke out of the water and slapping them on the water surface, also known as lobbing. 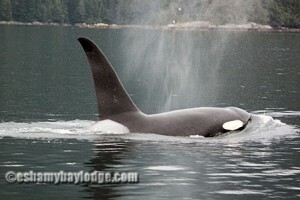 Humpbacked whales are often sighted from the lodge and in nearby waters in May, June, July, and August. Orca Whales, sometimes known as “Killer Whales” are also found regularly in the water n ear Eshamy Bay Lodge throughout Prince William Sound. 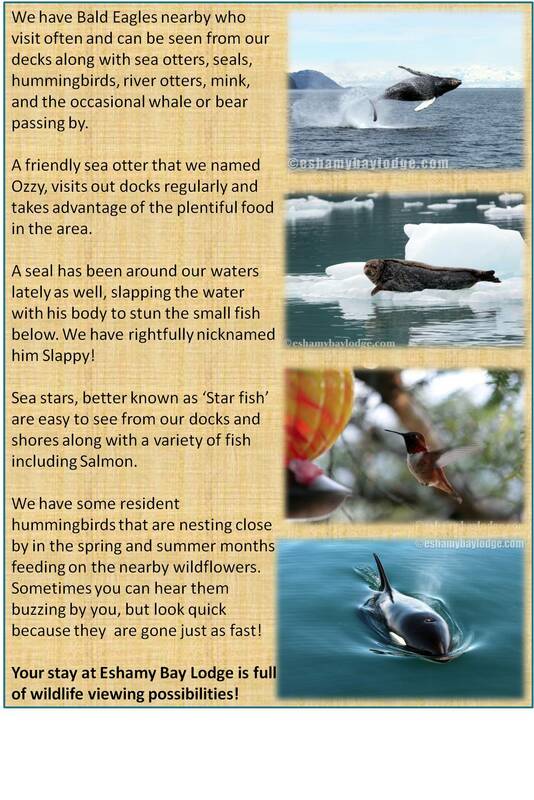 We have been fortunate enough to have them get up close and personal with us in the past! Some Orcas are known to stay in Alaska waters year-round, but the summer months are exceptional for a chance to view these magnificent animals. 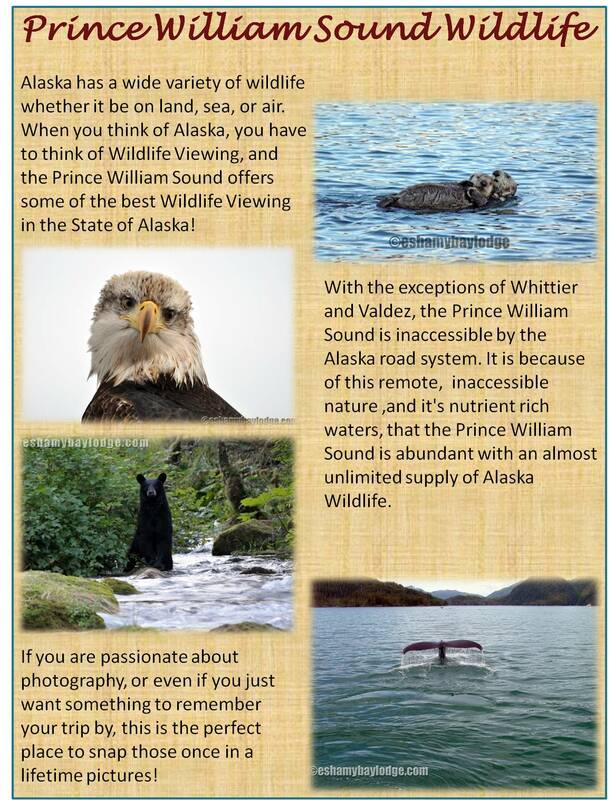 A wildlife and glacier tour is just one of the adventures you will enjoy from our Alaskan Adventure Package. On these tours, we also stand a good chance of seeing other wildlife such as black bears, sea otters, land otters, seals and sea lions as well as local and migratory birds.